Hi, I’m Jason and for 7 days (January 14-21), I tried to do the Wim Hof Method. This article will be based on my experiences, the benefits and how I did the technique. I would like to say that this has been a positive experience for me as you will see later in this article. I’ve got some great benefits and for some reason, a side effect if you will which I do not know why this is the case. Also, do note that this article is purely based on my experience with the technique, although I am also going to share all of the claimed benefits using this technique, I can’t prove them all in a span of a week. Before I start with this article, I would like to note some few points. First, I am here to paint the whole picture, which means that I will be completely honest with what I’ve experienced while on this technique for a week. Second, I am just 1 man who did the breathing technique, so this is purely my experience with the method. Do not expect the same experience and benefits as I did. However, I promise to do my best in explaining everything I’ve noticed while on this method. Fourth, this is a 1 week review so I can not prove every benefits that the people claimed on doing the said technique. However, since I personally experienced the technique. I will also say my view on these things. Fifth, I have morning allergies and suffered asthma ever since I was a child. This is great since one of the claimed benefits of using this method is to indirectly control the immune system. Sixth, I have no proof that I actually did and completed the method but I 100% all hands above swear that I really did the method consistently for a week. With those in mind, let us continue this article. Who am I to create such review on the Wim Hof Method? Well to be honest with you, I am no one. I am just someone who tried this method as I like to improve upon myself. You see, I love to try things to improve myself. Self improvement is my thing if you may. In fact, prior to this, I just completed a Dopamine fast and a 1 week no social media detox challenge which is a good read actually, and I’ve got a lot of experiences with them. However, my goal to succeed in life started when I did the 90 days no gaming challenge because I wasted the first 24 years of my life playing (Still 24 years old as of this writing). If you want to know why I suddenly changed, you may also read that article. Read whatever you feel is interesting. This blog has been for my self improvement and I actually want to share things with people because one of the person I look up to said that if I have something to share with the world, share it and do not be greedy. That’s why this website was made. So yeah, my name is Jason (which is actually obvious if you look at the name of the website 😀 ). As you can see, I am a young entrepreneur. Thus to increase my productivity, I am trying a lot of things about self-improvement. I am currently studying 2 new language (Mandarin and Japanese) as I find them interesting. In addition, I am also health conscious in which I try to stay away from things that are bad for my health. So why did I tried this technique in the first place? To be honest, the benefits interest me. Wim Hof method claimed one of the benefits as “Biohacking the body”. Some claimed that it cured their disease, powered up their immune system, able to dip for a long time in ice cold water, run a freakishly long marathon and the list goes on. Well since I am always busy with my life ever since I started my online business, it won’t hurt to try things out. An increase in energy levels would be so nice since it would allow me to do more things in a single day. Trust me, I squeeze a lot considering that I am also studying 2 different languages. Hey! Do not judge me. What is life without self improvement? Always take it to the next level right? I don’t want to be just working without improving myself, and learning a new language is a form of self improvement. If I can have more energy to take on the day, that is a nice plus. I also cut my coffee intake to the maximum of 2 cups in a single day so my energy levels are now low. I’m looking for other ways to get a boost. Thank you Wim for this technique! However, my reason for trying this out did not just end there. As I said above, I have skipped a quarter in my quarterly fast due to my busy schedule and what happened? Voila! My morning allergies are back, and it tries to steal my time in the morning. Plus, anti histamine (The drug used to reduce my morning allergies), have a drowse effect. Because of that, I get sleepy when I drink that medication. Combine that with a lot of things to do then you can paint the whole picture. I can’t allow this to happen. Since one of the benefits of Wim Hof breathing is to normalize your immune system, better give this a shot. A boost in energy levels and reduced allergies? Where do I sign up? Count me in! Where did I learned about the Method? Alright. To be honest with you, I don’t know where I learned about the technique. It just happened a year ago when I was binge watching some YouTube videos when it was introduced to me by a video which I do not actually remember what it is. After that, I research what Wim Hof method is and found a very useful app that teaches how to do it properly. In that app, the basics will be taught. So you will get how to do it. I like that it is really straight to the point and accurate. So if you want to try the Wim Hof Method, I suggest you use the application. This section would be what is Wim Hof Method, how I did it, its benefits (claimed by people and research) and what it does inside your body. Wim is a Dutch athlete that promoted this technique. He literally made a lot of world records and awesome feat such as the longest time on ice (1 hour, 52 minutes, and 42 seconds) and running a full marathon on the Namib dessert without water. As of this writing, the he has a total of 26 World records which is a crazy feat. Because of his feat that involves climbing mountains with -4 degrees Celsius temperature and dipping on ice for a long time, he is widely known as the “Ice man”. His breathing method became popular and he got some people to follow his footsteps. There are tons of research and stories of how people have a significant improvement on their life using this method. Because I’m a medical laboratory scientist by profession, I am going to prove some of it within this article. Well the benefits I’ve learned that they claimed to be true. Of course, I will also debunk something important. But anyway, it is awesome how Wim Hof changed the life of many people. Some of the people who did the Wim Hof Method even climbed Mt. Kilimanjaro, some said that their members have disease such as Rheumatoid Arthritis and Crohn’s disease. However, it did not stop them as they got to the top with just the training they got from Wim. How does the Breathing Technique Work in Our Body? In here, I am going to debunk the most popular explanation of how the Wim Hof Breathing affects out body since what they explained is the total opposite of what is true. So how does the Wim Hof Method work? It actually all boils down to breathing. As you will learn from the How to guide below, Wim Hof technique starts with breathing hard for 30-40 times, followed by a hold for how long you can possibly can and finally breathing hard for 10-15 seconds. So let us start with the breathing and how it works. At first, as you exhale tons of carbon dioxide by the deep breaths, you will lose a considerable amount of carbon dioxide in your blood. There are two effects on this, one is the reduction of carbonic acid which came from carbon dioxide, the second is hypoxia or the deficiency in oxygen reaching your tissues. So the lost of carbonic ACID will make your blood LESS acidic, thus turning it into slightly alkaline. This is probably for the better because a total change in pH would cause in death. That’s why some doctors order ABG (Arterial Blood Gas) to check on some critically ill patients because they are looking at their blood pH levels. However, the magic that the method does comes with the hypoxia or the reduced oxygen delivery from your blood to your body. WHAT? That’s completely the opposite of what the others are explaining about why the method works! Hear me out here. You see, while it is true that your blood is now bombarded with oxygen, the problem is you exhaled too much carbon dioxide. Carbon dioxide plays a significant role in oxygen delivery to the tissues. 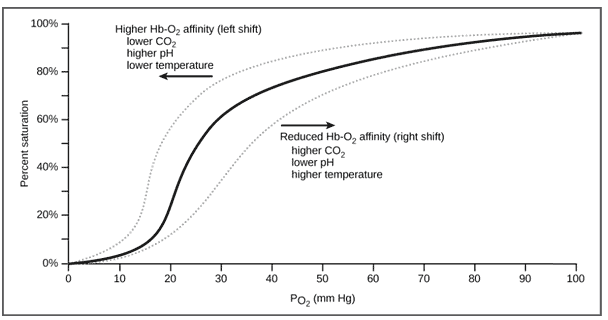 Now, that is called the Oxygen dissociation curve which is being taught in medical schools. Let’s us see where the Wimhof breathing takes place. Lower Carbon Dioxide (CO2) and Higher pH. Yes, that’s the left side curve. We call that the left shift in the dissociation curve. As you can see, one of the effects is that it has Higher Hb-O2 (Hemoglobin – Oxygen) affinity. Which means that Oxygen and Hemoglobin (The one carries both Oxygen and Carbon Dioxide) are tightly bound together. If they are tightly bound together, how could it deliver the oxygen to your cells? If you are tightly holding onto something, would you just give it to others? Exactly, your blood may have tons of oxygen, but it does not give it to your tissues. Less oxygen delivery to your cells will result to Hypoxia which is a phenomenon where your body doesn’t get much oxygen. This is also the reason why people get dizzy or why we get light headedness while doing this method. So, it brings some stress to your body causing it to release Epinephrine. Epinephrine, also known as “Epi” by some because of the EpiPen which is something you might be familiar about is the hormone responsible for all of this. This signals the activation of your “fight or flight response”, in which it gives the body energy and the feeling of high. Also hear that ringing sound on your ears? It is because epinephrine reduces your hearing sensation for a while. So why does the fight or flight does this? Epinephrine is something that can’t be usually ordered to be released. Because of the method it does. It usually happens in times of stress. Imagine our ancestors being chased down by a bear. It produces stress as who wants to be shred into pieces anyway? As epinephrine is released, it signals our body to strengthen up and focus. The reduction of the hearing sensation increases focus as you will be focused on running, and more energy release because you need to run fast. That’s a short explanation but I hope you get what I mean by this. Epinephrine is the reason of why this happening, and epinephrine is also the reason of the decreased inflammation seen by people who are into this technique. Because it decreases inflammation, autoimmune diseases are also decreased when epinephrine is released. That’s why you might know someone who brings an EpiPen (as I told you, it is epinephrine) with them especially if they have autoimmune diseases such as Rheumatoid Arthritis , Crohn’s Disease, or Lupus. That is also the reason why I know that it would reduce my morning allergies which spoiler alert, it did not just reduced, I got rid of it. The difference between the people in Wim Hof Method is that it is like they always have an EpiPen with them as they could signal their body to release epinephrine anytime. But I do not suggest doing it many times each day, as making your blood alkaline all the time could lead to some serious complication because it decreases your blood calcium levels. Basically, the Wim Hof Method is divided into three major parts if you will. As you probably already know, Breathing is the most important if you ask me on this list. I also did the others but I think this made the wonders and the benefits that it claimed. Is starts with 30 – 40 deep breaths of hyperventilation (Strong breaths). In this phase, you will feel tingling sensations (Decreased Blood Calcium) and light headedness (Hypoxia) as you do it. It is normal but DO NOT STAND UP WHILE DOING IT as it is reported that some faint. Please do not overdo it. I explained the light headedness above, as your brain’s oxygen level decreases because of the less oxygen delivery, you will start to feel light headed. I forgot to tell you that this is also the reason why people who practice the Wim Hof breathing can climb tall mountains with ease compared to people who are not. With time, much like out other body parts, their brains are used to this decrease in oxygen. You see, as you climb up a mountain, the oxygen level also decreases. That’s also why some people faint if they climb a mountain too fast. However, people who practice the Wim Hof method are used to decrease in oxygen levels. That’s why they can handle it well. Their body is used to it. So after a deep breath, remember that staying in the state of decreased oxygen delivery is also bad. Too much of everything is bad as you probably may know. That’s why to normalize it as fast as it could, you do the breath hold for as long as you can. Doing the breath hold has 3 functions. First, it allows the carbon dioxide made by your body due to your metabolism enter the bloodstream, this makes it easier to allow your body to deliver oxygen again because the proper blood pH will be restored. Second, is to bring up the oxygen required by your body because they lost their oxygen supply. Third, is to stress your body again as carbon dioxide is building up. That’s why they said that you should hold your breath as long as you can. Why do we need to stress our body again by building up carbon dioxide? It once again activates your endocrine system to release epinephrine. Wim said that after the breathing, your joints are much flexible and he teaches a way to properly stretch your body. You will learn more about this in the app or a Wim Hod Method tutorial. As for me, I don’t really experience any increase in my body’s flexibility. I still did it anyway. I live in the Tropics so we have no winter. No winter, no snow. In fact, I haven’t seen snow ever since I was born. So I can’t find some ice to lay down to as some are doing. But I got cold showers. Yup, I turn off my heater and immediately go to shower. I will explain my experience here in the benefits section. So after a long time of procrastinating on doing the Wim Hof technique (as I told you, it has been a year since I’ve known about this), I started to try doing it. So when I did the breathing, I noticed that as I do the breathing technique, I feel dehydrated. Well to be honest, I was expecting this. In exhaling, you do not just exhale carbon dioxide but also some water. So my tongue feels so dry after completing the three sessions of the breathing exercise which is what they recommended. Another, since I went into Alkalosis (my blood being slightly more alkaline [Basic] than usual), I had reduced calcium levels in my blood. How did I know? I had that tingling sensation on my arms and feet. I also expected this. Of course, I also experience light headedness because of hypoxia but I also expected that. The ringing as I said is because of the release of epinephrine. Until now, I can’t explain the Euphoria. Something unbelievable is my focus. With the ringing, I felt like I was so focused while closing my eyes as I incorporated it with my meditation habit. I do 15 minutes meditation everyday. But Wim Hof method amplified my concentration on meditation. I was so focused on the ringing on my ear that my meditation session was a breeze. I was so calm and suddenly, as I reach a very deep part of meditation which I haven’t experienced before, I was happy. I was smiling on my own like a crazy man. I do know why, I can’t explain everything lol. Even science right now can’t. I can’t explain, I was just happy. So if you need a boost in productivity, do a breathing session and you will notice the increase in focus. Why are you focused? Once again, epinephrine. Usually, when I miss my quarterly 3 day water fast, I get morning allergies. I usually have morning allergies for a few weeks, but after doing the Wim Hof every morning, I did not had any. Absolutely zero occurrence of my allergies. So I loved how this 5 minute exercise each day made my day a lot better than usual. Next is the cold shower. A few years back, I tried to have some cold showers because well it has a lot of health benefits. But it did not last long. The showers are just too cold for me. I want to scream when water hits my head. I did not like it. After being on the Wim Hof Technique, it became a lot better. I don’t know the reason but I can jump to my shower by just breathing hard and telling myself that I can do this. Did my mental power improve or I just became cold resistant? I do not know. I just know that being on cold showers did not make me feel like I wanted to shout because of the cold. Well not anymore. So here comes the favorite part of many, the benefits of doing the Wim Hof method. Take note that these are my experiences with it. Also I can’t prove all the benefits claimed since it has only been a week for me. This is my favorite. My family has a history of asthma and as you can see, I am one of the lucky winners that inherited that gene (Sarcasm intended). However, I do not want to take some medicine (Which includes epinephrine if you check the label). This has been a struggle for me ever since I can remember. I remember wheezing while breathing like someone who just did a 30 mile marathon without any practice. I was bad at sports at school because of this. To add more happiness to my life (Sarcasm Intended), I also have morning allergies. I blow up like a horn with roosters in the morning as I wake up the people around me. And as you probably already know, I do not want any medications. The problem is I noticed that after 3 months, everything comes back to the Allergy type of Jason(Me). So I do a quarterly 3 day fast. But I am busy with my online business, teaching job and studying 2 other languages. 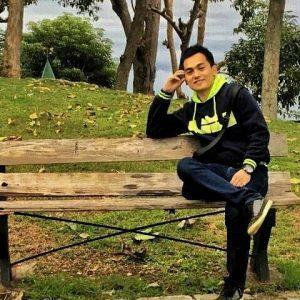 If you are interested in what I do for a living online, you can check this article out: How I Make Money Online. Thanks to Wim Hof method, I was able to control this problem of mine. 🙂 Thanks Wim and Endocrine system. After doing some breathing exercises, I notice that I got a lot more focus than usual. I was able to control my autonomic nervous system which is surprising. How I manipulated the thing that is long considered to be uncontrollable seems to be so cool. I also had increase in productivity. This increase in focus goes in line with what is next. Proof of my increased focus? I was able to write this 5000 word article in a single day. Not just my focus, my energy throughout the day also increased. With this, my productivity skyrocketed without having an urge to open YouTube or some social media accounts I have. Well I tried a 7 day social media detox so it doesn’t matter much. But you get the point. With the increase in energy, I was able to be more productive than usual. Making me proud of myself. I was overall happy with my progress everyday. Oh and also, I tried to run (first time). What’s surprising is that I ran for about 30 minutes straight and there is an uphill. I did not had any problems at all. I just kept on running until I circled our place and went back home. So physical and mental energy were through the roof! Amazing! Well, after new year. I ate a lot. My pants got so much tight and I had a big belly. Hey! Don’t blame me for that. There are pizza and lasagna on the table. So at the start of this year, I got a lot of belly fat lying around. I noticed that after 1 week doing the Wim Hof Technique, it got smaller that I was able to see my abs on the mirror. So COOL! Well, it is true, there are reports of people losing weight while doing the Wim Hof method as Epinephrine increases one’s metabolism because it burns more fuel for energy. As I said above, before when I tried to do cold showers, I want to scream as it doesn’t really feel great. I winded up quitting from that. Okay, this benefit is not written in their claimed benefits but I hands off swear that this is what surprised me. I was able to control my body more that I should be allowed to do. When my hands are cold, I can instruct my hands to make some heat. I don’t know but it works. I do not know why. When my feet are also cold, I can tell it to make some heat or to remove the cold feeling. This is super awesome as I haven’t experienced it until now. Right now as of this writing, just to be sure I tried to remove the cold sensation on my hands and it still works wonders. I was able to control what I feel, my mind became a workhorse. I still do not know why this happened. I guess our mind are stronger than we think it is. Well, there are a claims that it boosts the immune system. Since it has been a week, I can’t really prove that. Just that I did not get sick at all during the week. There are some research where people on the Wim Hof breathing technique were injected by E.coli endotoxin, Endotoxin is one of the covers of a Gram negative bacteria. Anyway, since it is part of the bacteria, it tricks our body into reacting to it thinking that it is the real deal. So people without the Wimhof breathing method reacted to it inducing some fever. People on the Wim Hof method reacted weakly or did not react at all with the endotoxin. So they claimed that it fortifies the immune system. I can not prove it since it has just been a week for me, but there are some that says they did not get sick for a whole year because of the breathing technique. But for 1 week, I did not experience any allergies or sickness. I can easily tell myself to get to that cold shower, tell myself to do my workout, I even ran for the first time in my life. If that’s not willpower, I do not know what it is. There came one night where my aunt went to buy some grocery but our car is like 500 meters (0.31 mi) from the grocery store. she bought about 28 liters (6.3 gallons) of milk. Since there is a car parking in front of ours (WOW), I was forced to carry that with 14 liters of milk in each of my hands. I carried it to our car that is far away and I did it. The old me wouldn’t be able to do that. That is too heavy plus I need to walk 500 meters. I was able to do it and she was surprised that I was able to carry that to the car. While walking I was mumbling to myself that “my mind is strong and I can do it.” I got the strength to do it. After that night, my shoulders are in total pain the next day lol. But the strength in times of emergency is surely helpful. Not everything is good. There are two things I’ve noticed that might be bad about this. I told you how I went for a run like? It felt like a breeze to run for 30 minutes like I was an expert runner. This shouldn’t be a problem but here me out. The next day hit me like a truck. I did not felt any troubles when running that on the second day, my leg muscles are too sore! I did not know that it would be the case because I did not felt tired at all during the run. Now, that is some disadvantage to me. I don’t know if I forced my body too much. But well, the benefits trample it right? Same with carrying those 24 liters of milk. I was able to carry it like a man who does power lifting. You can already guess how my shoulders felt the next day. In fact, as I am typing right now, I can’t really move my shoulders. This is weird. I do some workouts and I expect to get some gains, but it has been a week and I felt like I did not have some muscle gains. Is it because I plateaued? Is it because my metabolism is up the roofs? Is it because I am growing muscles but losing fat/glycogen? I have no idea. But when I see myself in the mirror, I felt like I did not have any muscle gains. I do not know, it is just my perspective. If this changes, I will let you know. But right now, that’s what I feel. So I in this article, I said that I did not gain much muscle like I did. I don’t know but I continued doing the Wim Hof method until this day. I just want to say that I think my body already adjusted to this? I am starting to gain some muscle mass again. When I started, I really didn’t gain any muscle mass. So I guess, after such time on the WIm Hof Technique, Your body will get used to it and will resume in gaining some muscle mass. As of now, I did not find any source that talks about this matter. But my guess is that I am gaining muscle but losing fat, so I don’t see me bulking up. Yes! Even with those disadvantage, the benefits intrigue me so much that I will continue to do it. If I notice something, I will surely update you. I love the Wim Hof Method as it was very interesting to me. Do I Recommend you to try the Wim Hof Breathing Method? If it also intrigues you, do it. It is really a great experience for me that I tried it. I love the benefits and if it can also help you, then go do it. However, I do not recommend you to overdo it. Just once a day for 3 breathing sessions. That is enough, do not always change your blood pH levels. There is a reason why the normal blood is pH 7.4. Also, don’t forget to share it with us with a comment down below if you also did it and have some experiences. Who knows? If I find it very interesting, I might add it in this article to help out the others. If you have a friend who is interested or you think will be interested with the Wim Hof technique. Why not share it with them? They might appreciate your help. That’s all. Kind regards to you! Great summary and explanation, thank you! I will definitely try this.